Tatooine—a harsh desert world where farmers toil in the heat of two suns while trying to protect themselves and their loved ones from the marauding Tusken Raiders. A backwater planet on the edge of civilized space. And an unlikely place to find a Jedi Master in hiding, or an orphaned infant boy on whose tiny shoulders rests the future of a galaxy. Of all the characters in the Star Wars universe Obi-Wan Kenobi has always been my favorite. His wisdom and calm, patient demeanor always resonated with me. I always wondered what happened to Obi-Wan after bringing Luke to live with the Lars on Tatooine. Well gentle readers wonder no more for his story is told. Miller did an excellent job of keeping things on a smaller scale, but keeping it action packed. It would have been easy for Obi-Wan to face the threats head-on but that would expose him, and possibly Luke, to the Empire. Obi-Wan must find a subtler way to protect Luke and his new neighbors, while at the same time retaining his anonymity. Miller does a fantastic job at weaving this conflict into the story. The book had a bit of a wild west feel; the general store , the bar, and the moisture farmers. All of this gave the story great atmosphere. It must have been difficult for a man of action such as Obi-Wan to adopt such a hermetic lifestyle as he did on Tatooine. I am sure that his Jedi training helped because of the focus of non-attachment to people and things. It still must have been difficult for him given Anakin’s fall to the darkside and the eradication of the Jedi order. Kudos to Miller on how Obi-Wan’s inner turmoil is played out in the story. The book also touched on his loneliness, and you get to see an even gentler side of Obi-Wan. There were some very touching scenes and your heart goes out to him because you get a true picture of what he gave up to keep Luke safe. We also get to see how the legends of “crazy of Ben” came to be. This is one of the best Star Wars books I have read in years and hats off to Miller for an absolutely amazing job on Kenobi. 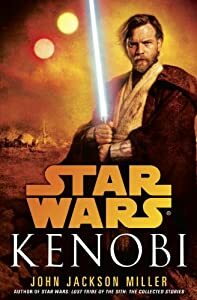 I think this book will become canon in the Star Wars expanded universe and will the be reference point for all readers when asking the question, “what did Obi-Wan do all those years on Tatooine?”. I received a copy of this book from NetGalley in return for an honest review. Posted in Book Review, Star Wars. Tagged book review, new release, starwars.